Ideal for blind or low vision shoppers. Made of genuine, soft, high-grade leather. Has four separate full-length compartments to separate bills. Features 2 snap-shut compartments on the left for change and a larger one on the right. Contains a fold-out card holder in center for 6 cards. Even boasts a transparent photo-ID holder in the front. Measures 4" square when folded. There's nothing like this black leather wallet for organizing everything you need to keep track of. How many times have you pulled out your wallet at the check-out counter, only to discover you need to ask the cashier or a fellow shopper which bill is a twenty? How would you like to be able to organize your paper money, change, credit cards, checks, receipts, and anything else in such a way that you could find whatever you're after completely on your own - in a matter of seconds? Well, it sure sounds like you're in the same boat many of us were here - before we designed our leather money-organizer wallets - which are ideal for blind or low vision shoppers. 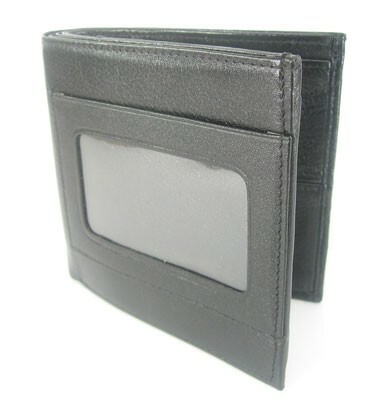 Made of genuine, soft, high-grade leather, this black, custom-made wallet is suitable for both men and women. When you open the attractive, folding wallet, you'll find four separate full-length compartments for paper money, making it easy to differentiate between $1, $5, $10, and $20 bills. Furthermore, on the left are two snap-shut compartments for change, and On the right is another large snapped pocket for miscelaneous things like larger $50 or $100 bills, checks, receipts, a signature guide, or a slate and stylus. 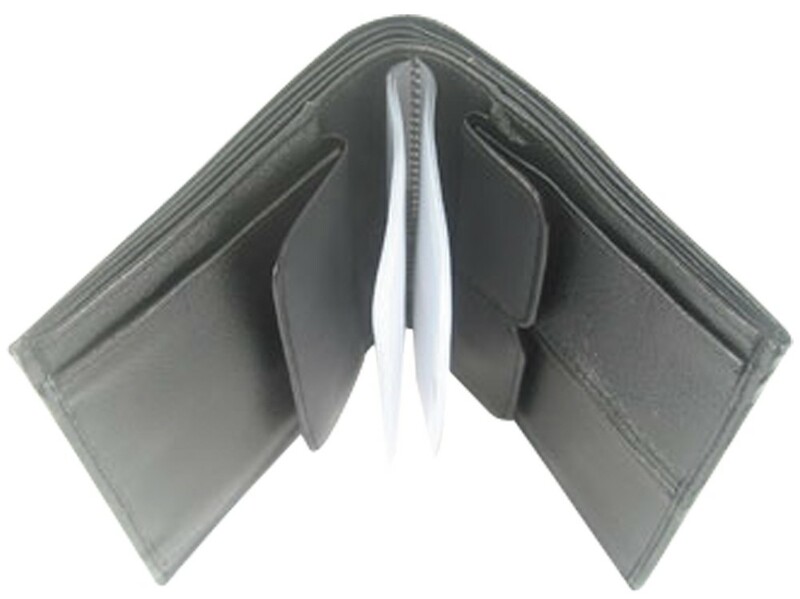 In the center of the wallet is a fold-out card organizer - which holds six credit cards or business cards. When folded, this wallet measures four inches square, and even boasts a transparent photo-ID holder in the front. 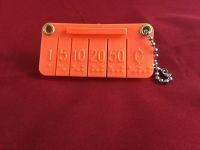 Directions for the Leather Organizer Wallet From Future Aids, The Braille Superstore.